We invite you to a world of fantasy and fun where pirates and fairies race trikes in the sun. 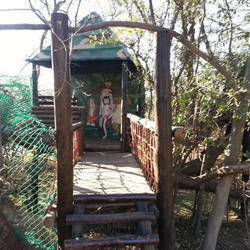 Princesses are rescued from treehouse seclusion while mice swim in cups of free tea infusion. Party venue with trampoline, jungle gyms, slides, swings, wendyhouse, tree house, scooter track, soccer field and more. Entertainers available from face painting to the snake man. Large indoor area and equipped kitchen. Catering, themed decor and cakes available. We offer a stunning play area for children including jungle gyms, trampoline, treehouse, Wendy house, bike track, sandpit, Toadstool house, cricket pitch and much more. Panoramic view of the play area from wherever you are seated. 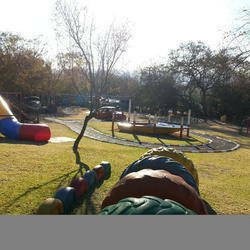 The cost for PLAY DAY is R 30 per adult and R20 per child. This rate includes a slice of cake or a muffin & coffee or tea for the adults and a packet of chips and juice for the children. There is ample, secure parking. Baby changing facilities. Come and enjoy a wonderful afternoon @ Elf's Hill for the whole family. Space is a great luxury, let your children enjoy all of it at Elf's Hill and go home feeling satisfied and exhausted!! 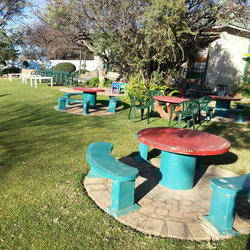 Venue hire for 3 hours is R1150 (midweek) and R1850 (weekend and public holidays). This price is for 40 children, more can be accommodated at an extra cost.